Your social media profiles and your website are parts of a virtuous circle. You always want to cross‐promote your website content on your social media channels while promoting your social media presence on your website. The relationships among your various channels should be symbiotic; each helps and promotes the others. People at the companies behind all the big social media sites understand the importance of connecting to website content and provide a wide variety of social sharing and promotional tools for you to use. All the major social media sites offer ready‐to‐use sharing tools such as promotional badges and buttons. The tools are free to use and often include a fair number of customization options. In addition, some third‐party services offer plug‐ins for the most common content management systems. These plug‐ins aren’t tied to a single service; they allow you to connect with many of the most popular social platforms. If you’re using WordPress or one of the other popular content management systems to manage your website, you may find that some social media tools are built into your website theme or template. Although these tools are often limited, they’re extremely easy to implement. If you need richer functionality, add a plug‐in or widget to your site. Raise awareness of your social media profiles. Enable sharing of your website content. Display social media content on your web pages. When it comes to publicizing the existence of your profiles and giving users the chance to share your content, you have plenty of choices. Which tools you use is up to you, but there are some clear winners. Channels such as Facebook and Twitter have so many users and are so commonly used that you certainly want to make it easy to connect with those platforms. You should look beyond the obvious choices, however. Although the other services may not deliver as much (or as frequently) as the biggest sites, those other services’ contributions to your traffic and your visibility can still add up. Integrate social sharing tools with an eye to achieving maximum effect. The goal isn’t simply to make it possible for users to share your content; the goal is to encourage sharing. Effective promotion of sharing is largely the byproduct of two factors: placement and selection of sharing tools. Placement of sharing tools is one of the keys to success. You want the tools to be visible at the right time, which is an issue that crosses the line between psychology and usability. Will users want to share an article before or after they read it? It’s more logical to assume that people need a prompt to share at the end of an article, after they’ve read it and decided that it’s worth sharing. Placing the social sharing prompt at the end of the content also means that the user doesn’t have to scroll to the top of the page to find the sharing tools. If you want to play it safe, place sharing prompts at both the top and the bottom of the article. 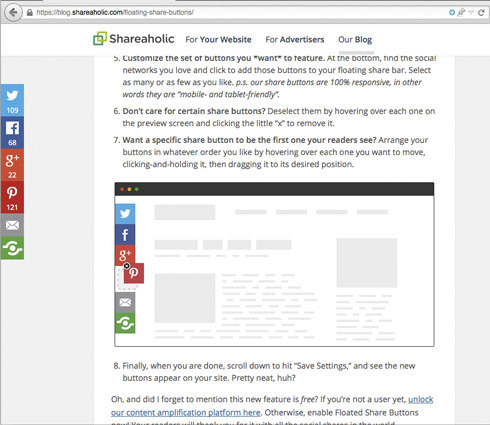 Some third‐party systems, such as Shareaholic, offer a floating toolbar that remains visible alongside the page contents as the user scrolls up and down the page. Regardless of which approach you take to the placement of your sharing tools, it’s important to provide easy access to the channels that suit your content and your users. For most sites, you should integrate at least Facebook and Twitter. For other sites, the choice of sharing options depends largely on the nature of your content and the proclivities of your target audience. 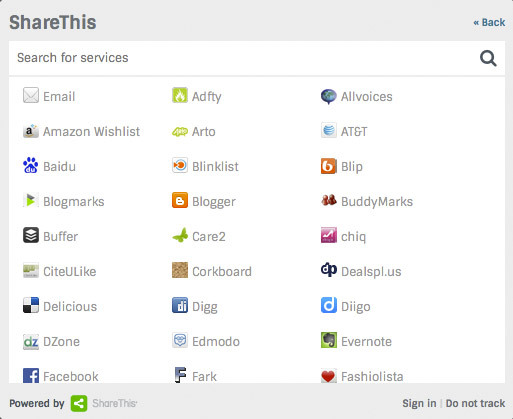 Here are some ideas to get you started with the selection of basic sharing tools for your site. The easiest solution to the dilemma of implementing tools for multiple social media sites may be to use a third‐party sharing widget that provides links to multiple services. A service such as ShareThis is one solution, though it does add a bit of complexity for your visitors. The ShareThis plug‐in provides a wide range of options for sharing your content, and this means the user has to click the content and then find the service to which he or she wants to share; it’s a bit more complex than just having a simple button someone can click for an instant share to a specific service such as Facebook or Twitter. Integrating social media content into your site not only promotes the social media profiles, but also provides a richer experience for site visitors. Facebook and Twitter content‐sharing widgets are widely used on the web, but other services (including Pinterest, YouTube, and SlideShare) have widgets that are free and easy to implement, and you shouldn’t neglect these alternatives. By displaying photos, videos, or external documents, you provide your visitors a richer content experience that’s likely to translate into longer time on the page and better engagement.